Several large food producers and regional food processing companies in the global guava puree market are spending sizably on bolstering guava production. Transparency Market Research (TMR) finds that numerous players in the global guava puree market are emerging as substantial suppliers of guava puree to food producers. Several companies in the value chain are focused on improving the taste and texture of end products, in order to consolidate their positions in the global guava puree market. 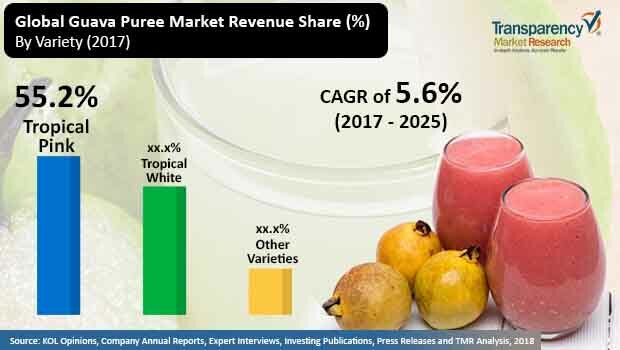 Some of the key companies that aim for higher stakes in the global guava puree market are iTi Tropicals, Inc., Döhler Group, ABC Fruits, La Fruitière du Val Evel, Allanasons Private Limited, and Sresta Natural Bioproducts Private Limited. The global guava puree market stood at US$ 313.8 mn in 2017 and is projected to clock a CAGR of 5.6% during 2017–2025. Among the different varieties of guava puree products, tropical pink type held the major share in the global market in 2017. The segment is likely to retain its dominance in the coming few years, at least till 2025. The prominent demand for pink type guava puree products could be attributed to its velvety texture and appealing aroma. Regionally, Asia Pacific is anticipated to lead the global guava puree market, both vis-à-vis value and volumes throughout the forecast period. This is attributed to the extensive use in making blends and nectars in the beverages industry. Meanwhile, the Latin America guava puree market is expected to emerge as prominent growth rate year-over-year. The global guava market rides on the back of increased consumer popularity of processed fruit-based beverages in various countries across the world. Guava puree are increasingly being used in making bases for a variety of food products such as ice creams, desserts, smoothies, cocktails, and savory sauces. The global guava market has received a solid fillip from ceaseless and noteworthy advances made in the cultivation as well as processing of guava. In developing regions, a fast-paced processed food and beverage industry has opened abundant growth opportunities for producers of guava puree. The various health benefits of the tropical fruit, as for diabetics, may unveil an exciting avenue in the global guava puree market. The consumption of guava comes with several health benefits, notably in maintaining a healthy digestive system. Robust supply of guava in various parts of the tropical and subtropical regions sustains the rapid evolution of the guava puree market. Countries in the western part of the hemisphere have recently developed a robust liking for the tropical fruits, which is propelling the demand for guava puree. Constant focus of food producers in major guava cultivating regions on developing new taste, flavor, and texture is catalyzing the rapid expansion of the global guava puree market. Increased awareness about the various health benefits of the guava is bolstering the demand for guava puree. However, unfavorable weather conditions in major guava producing regions such as in Asia, notably in India, have impacted the prospects of the global guava puree region. For instance, El Niño and La Niña adversely affected the export volumes from the region. Moreover, the lack of adequate technology for processing guava puree has also impeded growth in the global guava market to an extent. Nevertheless, the advent of better post-harvest technologies in recent years has benefitted the processed food and beverages industry. Moreover, substantial advancements being made in food processing techniques bode well for the global guava market.